For decades, Orcs and humans clashed on both sides of the border for food, revenge or simply sport. Over time, this became a habit: anyone born in this rainy region became a hardened warrior. It was then that the zombie plague ravaged the country, sweeping away the armies, the population and the border itself. We survivors are looking for answers to the threat of necromancers. Will you be brave enough to follow us into the heart of the land of the Orcs and face the horrendous corrupt zombies that haunt this wilderness? Are you ready to engage in an unprecedented Zombicide? Make new friends and develop new tactics by hunting Zombies with 4 new Survivors and 19 Equipment cards, including 6 Magic Families! Test your firepower against the Corrupt Walkers led by a terrible Abomination through 10 unique Quests that will take you to the heart of the wilderness. You can also use the 5 new tiles to create your own sagas! All elements are compatible with Zombicide's fantastic medieval range of products. Be careful this game is an extension of Zombicide: Green Horde ... + 1 more+ 1 more and cannot be played alone. 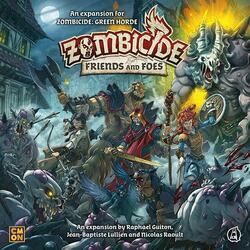 To be able to play it you must have a copy of the game Zombicide: Green Horde ... + 1 more+ 1 more.